From where I sit, that basically means “You’re going to like pointing, but stay tuned to this channel, eyepaper fans.” Sweet, the first product is just hitting the streets and already with the teasing. So I’ve been testing a pre-release iPhone version of World Surfer. The basic premise of the application is more or less the same as all the other recent entrants in this space: mobile smartphone with GPS and digital magnetometer (compass) knows where you are, knows what direction you are facing, connects to a web service and shows you points of interest (POIs) from a database of georeferenced entities. Where it differs is its focus. World Surfer is designed for finding what you are looking for, and then getting you there. It’s not an AR magic lens, but it is a tricorder, or perhaps a divining rod for hidden information. You point in the direction you are headed, you browse one of the local channels like Bing, Yahoo, and Wikipedia, scope out the restaurant or attraction you want to go to, and World Surfer shows you the way. Literally, a big red arrow shows you which direction to walk. You can also get traditional driving directions on a Google map view, click to call, check reviews, and see related search results from Flickr, Google and YouTube. Â It is easy to switch between the directional pointing mode and 360-degree search, depending on what you need at the time.Â In operation, the app’s performance was smooth and responsive, and the touch-based user interface was easy to learn and navigate after a few minutes of poking around the various controls. World Surfer has a lot in common with the Yelp iPhone app, so I tested them side by side. 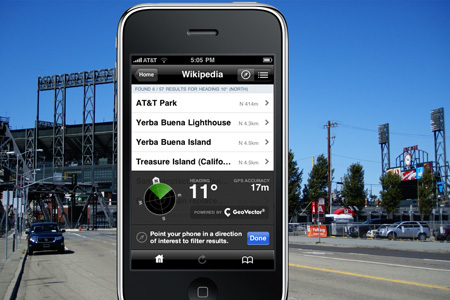 World Surfer is definitely much more of a native geo-app with its pointing and wayshowing model. Although it doesn’t have Yelp’s huge user community and name recognition, World Surfer has broader applicability because it supports an arbitrarily wide range of channels. Yelp does have that Monocle AR eye candy thing, which looks cool but unfortunately is pretty much useless. In the end, my conclusion was that Yelp should actually just be a channel on World Surfer. Speaking of channels, I was pleasantly surprised to find that World Surfer’s channels are dynamic. That is, the channels available to you are contextual to your location, and when a new one becomes available it just shows up in the app. After the first new channel magically showed up, I found myself opening up the app several times a day just to see if there was anything new to point at. Other features I liked about World Surfer include bookmarking — you can bookmark your current location, which is good for remembering where you parked your car, Â and the toilet channel (!) provided by sitorsquat.com, which shows public restrooms with user ratings. That last one sounds a bit weird, but is unbelievably handy for a day of wandering around the city consuming refreshing beverages of your choice. * Having Bing, Yahoo and Google channels feels redundant. Each has a different browsing hierarchy, which is confusing. And each has a different but incomplete dataset of POIs. Of the three, Bing seemed the most comprehensive (probably due to their Citysearch database) and Google the least so (Google limits local search results to 32 items per query). * No search box. World Surfer would be substantially improved if you could search across all of the current channels with a single query. Sometimes browsing a directory tree just isn’t what you want, right? I thought we learned that on the Internet awhile back. * Branded channels. My test app had channels for a coffee company and a pizza chain. I understand the rationale and the business imperative for having branded channels, but I also can see how the user experience is likely to be degraded when a large number of brands get on the bandwagon. Imagine scrolling through a list of channels for every major national brand that has stores near your location. There’s a significant set of UI & UX issues that need to be addressed for small-screen mobile AR in a large-dataset world. * No ability to add content. Although you can read reviews of many establishments, the current channels don’t provide any way for you to add ratings and leave comments the way you can on Yelp, for instance. Also, there is no mechanism for end users to create their own POIs on any of the channels. * No elevation pointing. In Japan, you can point your phone up and down and get different results, for example on different floors of a tall building. According to GeoVector, this is a limitation of the US phones’ magnetometer system. Too bad, I’d like to see elevation become part of the standard spec for modern geo-annotations and POIs. * Inaccurate for close-in POIs. Like other GPS+compass apps, WorldSurfer doesn’t handle POIs well if their position is within the error range of the device. However you can deal with this by manually switching to 360 mode. * POI data quality. GeoVector gets their POI data from third parties, and the datasets are often incomplete or inaccurate. Like other players in this space, GeoVector needs to step up and take ownership for their users’ experience, and start driving industry standards for data quality. Overall, my conclusion is World Surfer is quite a nice useful app, especially for people who like exploring cities on foot. It looks good, works well, and doesn’t make you feel self-conscious when you use it. There is definitely room for improvement, but none of the issues are showstoppers for a version 1.0 release. However GeoVector really needs to ramp up its developer activities, because it is the content and presentation of the specific channels that will make or break the usefulness, applicability and user experience that gets delivered.